Blog post adapted from Fernie Fix Magazine. Submitted by Lee-Anne Walker to FernieFix. My world turned upside down when my mother died. We had a special bond and the pain of her loss was unbearable as her birthday approached in late September 2011. To cope with the stress I escaped with my husband to the tranquility of wilderness and nature. Since starting the Elk River Alliance in 2010 I always wanted to hike to the Petain Glacier, the source of the ribbon of life that connects all of our communities and the river that is the inspiration for our community-based water group. We packed knowing there are no amenities in the park and that weather conditions can change suddenly. Self-reliance is key and cell phones don’t work there. Elk Lakes Provincial Park is located at the north end of the Elk Valley. To access the Park, turn north at Sparwood on Highways 43 and travel 35km on pavement to Elkford. Keep driving north through town and the remaining 70kms or 2-hour drive is on gravel, which can be in rough condition. Be sure you have a spare tire in good condition and a set of jumper cables just in case (which did end up coming in handy). The upper Elk Valley is actively logged so always beware of, and yield to, loaded trucks and other industrial traffic. The drive is spectacular as the Elk River transitions to a meandering creek, then calm wetlands and finally Lower Elk Lake. Numerous peaks tower over 3000m. Remnant glaciers drape off peaks with cascading waterfalls the source of the Elk River. If we had known about the new Alpine Club of Canada, Elk Lakes Cabin, we might have splurged the first night. For $25/night this gorgeous log cabin provides mattress pads, propane stove and lights, and cozy wood stove. It can be booked summer and winter. 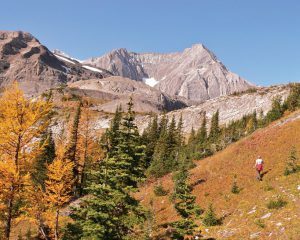 Most users access the cabin from Elk Pass near Upper Kananaskis Lakes, a 9km hike, mountain bike, ski or snowshoe. Instead we carried our backpacks from the trailhead along an easy 1km stroll to Lower Elk Lake. There are ten wilderness campsites offering pit toilets, fire rings and tent pads. On my first visit to this site in 1984, I was almost trampled early one morning by gangly, uncoordinated twin moose calves tromping around our tent. It is a short 1km hike to Upper Elk Lake and another 3kms easy hike to our base camp at the bottom of the Petain Creek Waterfall. Crisp fall weather had kissed the leaves red and yellow and killed off all the bugs. After a hearty meal we collapsed in our cozy tent. After the 2-hour, 4km strenuous ascent north of the waterfall we crested the Petain Basin with endless routes and options to wander in the spectacular alpine meadow. The day was dead calm, silent and eerily peaceful. My mother was a devout woman of faith and she was a pillar for me on my spiritual journey. As I reclined in the carpet of mountain aven after lunch, warmed by the sun I felt a peacefulness to “accept the things I cannot change, courage to change the things I can, and wisdom to know the difference” (Reinhold Niebuhr, 1934). Her presence was with me then and always, reflected in the spectacular Rocky Mountain landscape and source of the river that guides my passion today.